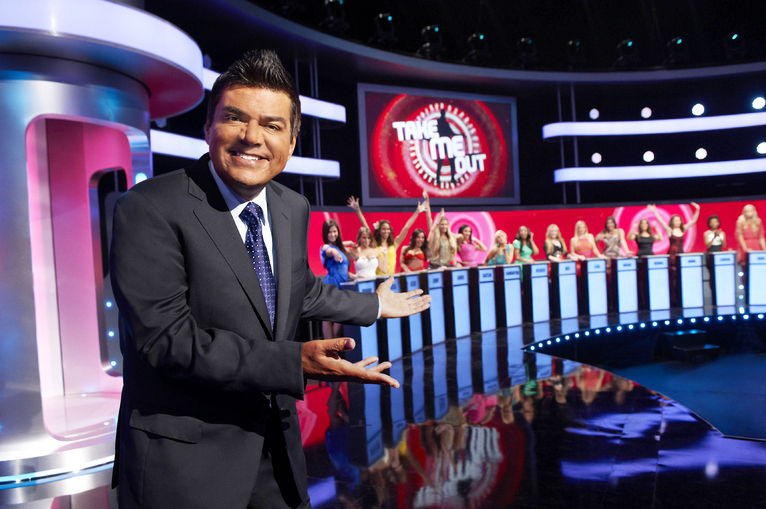 TAKE ME OUT: With George Lopez- Set News! Comedian and former late night talk show host George Lopez has taken over Americanized dating game show version of the UK itv “Take Me Out”. A dating show that started in Australia under the name “Taken Out” has been remade in fifteen other countries including Japan, Ireland, Norway, Philippines, Spain, China, and Denmark with titles ranging from “Pick Me” to “Man of the Day”. “Take Me Out” will mark FOX’s second dating show for the new summer TV season. The other one is celebrity dating show called “The Choice“. Shooting at the Culver City studios has finished and Hollywood Junket was there during one of the many days of filming. What we saw was 30 gorgeous young women each at their own lighted podiums who first welcomed host Lopez who entered via an elevator landing onto the stage, and then a bachelor who enters down the same elevator. The second round begins with the showing of a video on a big screen of the male dater that depicts his everyday life. More women can choose to drop out of the game during this time. However, once a woman has turned her light off, she can not change her mind and turn her light back on. Some examples of male daters included a cowboy, an ex-stock broker and one surprise male date was down on his luck. In his video he is seen riding a bicycle, taking a city bus, and eating at a discount diner. You guessed it, all but one woman was out of the game by the end of his video. The third round consists of the bachelor in play showcasing his special skill to keep or weed out the remaining women. The cowboy rode a mechanical bull. One bachelor during another show came out in full Gladiator gear. Lopez spends much of the show interviewing the women on why or why they wouldn’t go out with the male contestant. Some reasons women gave was “he is too much man” (as in too big), not tall enough, didn’t like the cowboy lifestyle, and many other superficial reasons. The remaining women with their lights on at the end of the game are the ones whom the male contestant gets to chose who he’d like to go out with. Male daters select their girl by going up to the women and getting a closer look as well as asking them a question or two. “Take Me Out” can be seen on FOX starting Thursday, June 7th.